Select Autodesk® AutoCAD® blocks by attributes value and you can select multiple block types that have the same attributes name. Build query statements by more than one condition status, and check if the attributes value is numerical or not. Select Blocks by dynamic visibility status. Manage selected blocks attributes values in block data grid which displays all attributes values, block layers and its dynamic visibility status as data sheet in editable file. Its dynamic grid can combine identical rows with count, hide show columns, and show summary summation of numerical column. You can change attributes values to multiple block types with the same attributes name. Also you can export the data grid content to Excel file directly. Block Data Grid helps you to select unselected blocks. It provides an option of zoom to the particular block or more than one block. The user can make sure of the blocks before editing the attributes value. 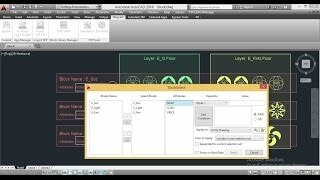 Tags: AutoCAD, Block, Select, Attributes, Values, Visibility, Dynamic Block, Add ins, numerical attributes values, Layer, Excel, Data Tools and Summation.